Yes, it's fibre for spinning, it's very fine (3 micron), antistatic, and conductive! It's stainless steel. 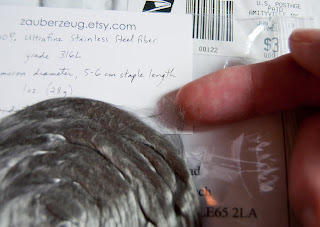 Two surprises, I got my quantities muddled up - I was expecting 100g, this is 1oz which is about a third of that - and in the pictures it looked as if it had some colour but in fact it's metallic silver-grey just as you'd expect. Alone it feels surprisingly fluffy but with a strange abrasive feel. I wonder what spinning the pure stuff would do to your fingers? Can't wait to see what the resulting metallic yarn looks like. I shall follow this with interest, was reading about this fibre recently and am intrigued ... maybe one day.